A Lifetime Of Planting Trees On A Remote River Island: Meet India's Forest Man : Parallels A humble farmer from a marginalized tribal community takes on a solo mission to reforest an island in Assam, India. 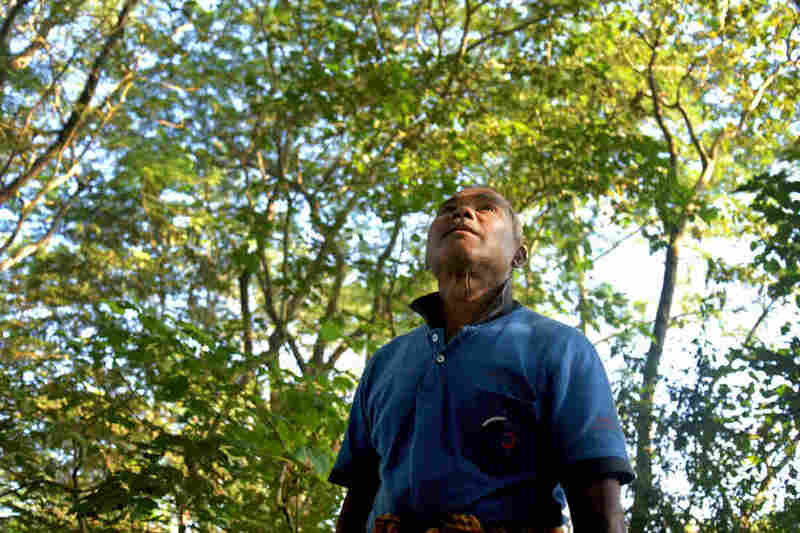 Jadav Payeng, "The Forest Man of India," has planted tens of thousands of trees over the course of nearly 40 years. He has made bloom a once desiccated island that lies in the Brahamputra river, which runs through his home state of Assam. On a journey to the little known Northeast region of India, you may encounter a dizzying array of traditional tribes, rugged beauty and wildlife, including the rare white rhinos. It's here we discover perhaps an even rarer creature: the "Forest Man of India." A humble farmer from a marginalized tribal community, Jadav Payeng has single-handedly changed the landscape in his state of Assam. 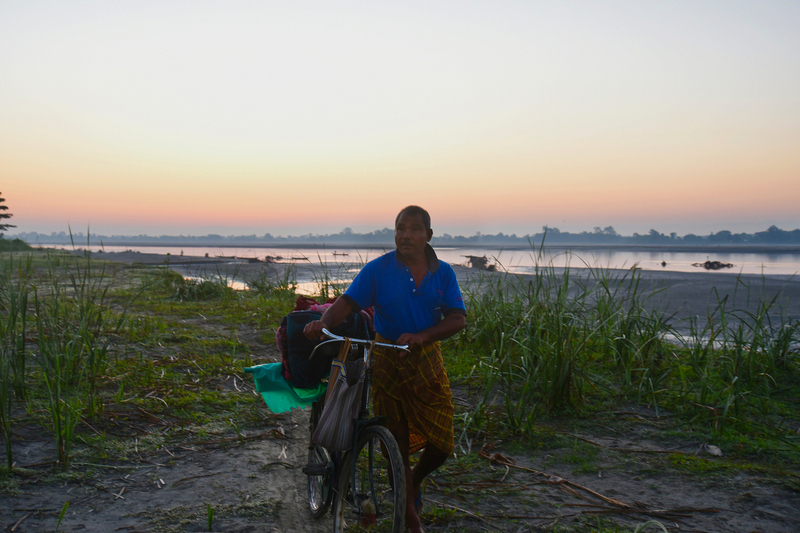 Payeng, 58, is reclaiming an island in the mighty Brahmaputra river where increased flooding has changed the flow and built up sandbars along the long stretch of the river that runs through the middle of Assam. Payeng keeps the hours of an insomniac. We arrange ourselves in a boat for a short passage with him to his river island. By 4:30 a.m. we're gliding across a moonlit channel. A fish jumps — making perfect ripples on the water's still surface. We alight on Payeng's island as the pink sky begins to push out the stars. The riverbanks are home to some 250 families from the Mishing tribe. Payeng explains that they have inhabited the area for eons, and there are no deeds or titles to land. He hauls his boat ashore, unloads his bicycle and begins the daily 2-mile trek to his vegetable farm and his life's mission: reviving the ecosystem here. When Payeng was a boy, the son of poor a buffalo trader, this strip of land in the middle of the river was attached to the mainland. Erosion from powerful river waters of the Brahmaputra severed it. He bends down to pick up a handful of earth to explain how the island's landscape has changed. "Earlier, this was all sand. No trees, no grass — nothing was here. Only driftwood. Now, seeds of grass carried downriver from China wash up, and pollinate, on their own." What began as a bamboo stand has grown into a dense 1,300-acre forest. The biome single-handedly nurtured by Payeng for nearly 40 years is home to tigers, deer, monkeys, elephants and a wide variety of birds. Today fields of swaying grasses stretch into the distance. Along with emerald pastures dotted with cows, cotton trees stand straight in rows as far as the eye can see — "excellent plywood," Payeng says. He planted them, his hands transforming this once barren island the size of Martha's Vineyard. "First with bamboo trees, then with cotton trees. 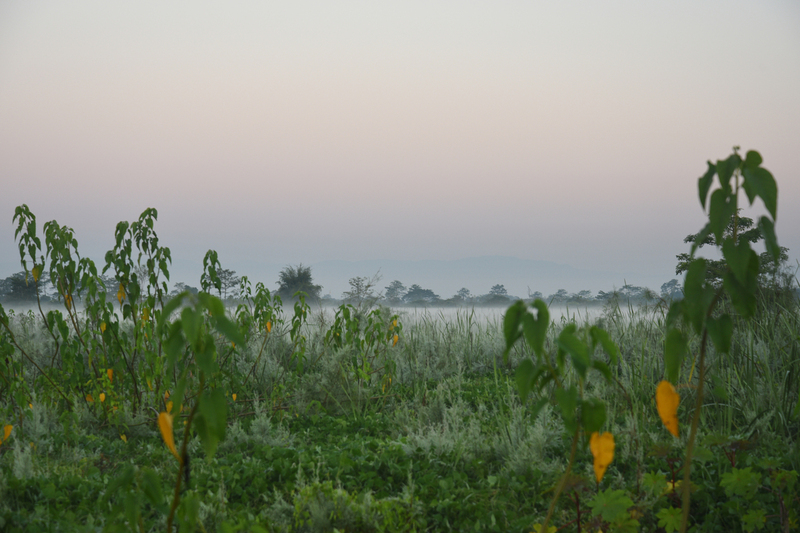 I kept planting — all different kinds of trees," Payeng says. "It's not as if I did it alone," says the self-styled naturalist. "You plant one or two trees, and they have to seed. And once they seed," he adds reverentially, "the wind knows how to plant them, the birds here know how to sow them, cows know, elephants know, even the Brahmaputra river knows. The entire ecosystem knows." Jadav sought no permission to plant a forest. He just grew it, carrying on what he says is his Mishing tribe's tradition of honoring nature. 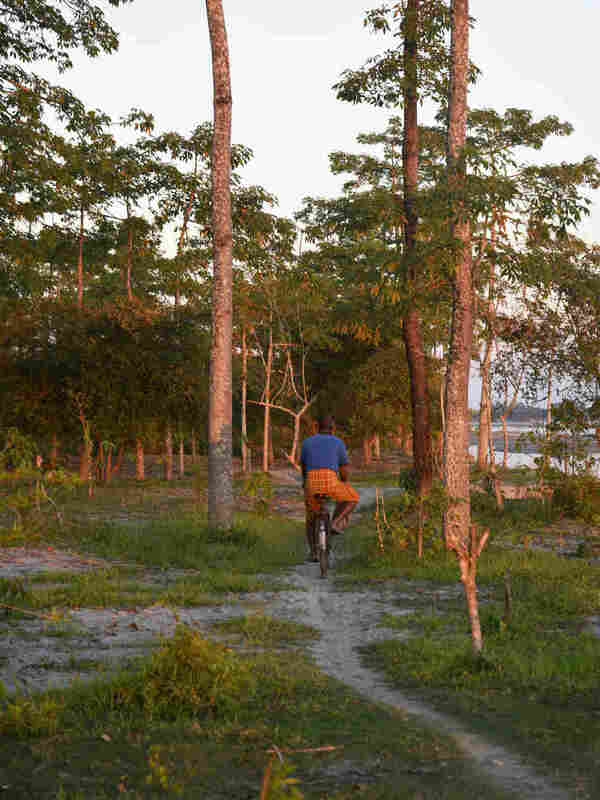 Jadav Payeng covers the distance from the island banks to his forest on his bicycle, carrying the supplies he uses while working on his forest and abundant vegetable farm. Payeng started planting here in 1979, stirred by a freakish site: dead snakes piled on sand in scorching temperatures, perished for lack of shade or tree cover. "When I saw it, I thought even we humans will have to die this way in the heat. It struck me. In the grief of those dead snakes, I created this forest." Over the course of nearly four decades, Payeng says he's planted so many trees, he's "lost count." He estimates there are "hundreds of thousands" of them on the island now, groves so thick they shocked even the Forest Department when it stumbled on them. Once considered "crazy" by local inhabitants, Payeng is celebrated today as a conservationist. Sitting in a meadow beside his forest, he credits a botanical scientist for nurturing his fascination for the natural world. Mist rises from the tall grass that has grown over the island in the last four decades since Jadav Payeng initiated an effort to transform the sandy stretch of land into a vibrant ecosystem. "Every day he taught me how to plant trees and care for them. Since childhood. It's in my soul," he says. Whacking back foliage, this Mishing tribesman separates out poisonous plants from medicinal herbs. He drinks a concoction of herbs every day for his health. He smiles and says a hundred different herbs grown on his island make up the recipe for the local beer. Payeng guides us to some of the oldest trees he's planted. Beneath a high canopy he leans against a 30-year-old teak tree with fresh scratches on the bark where a tiger has sharpened its claws. He says that he's lost 85 cows and 96 buffalo tigers, and describes coming face to face with one of the big cats that now inhabit the island. Payeng scoffs at the danger. "I wasn't scared," he says. "I know that tigers have half the courage of women. This one killed a buffalo, saw me, and slinked off." 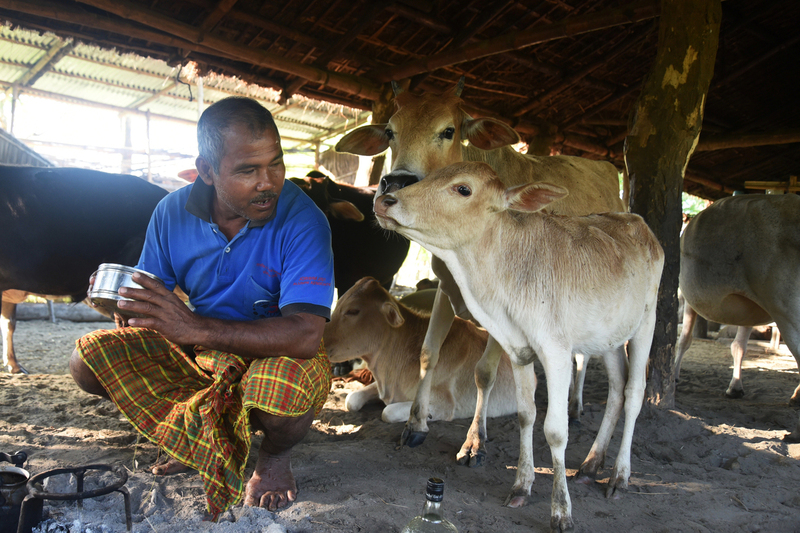 Jadav Payeng kneels before a fire in his cowshed, preparing morning tea before he ventures out on his daily rounds tending to the Molai Forest and collecting edible and medicinal herbs. "I never feel danger in the forest," says this self-described lone wolf. "It's my biggest home," a home which in addition to tigers is filled with deer, monkeys, elephants, and a wide variety of birds. This father of three delights in the fact that wild elephants cross the shallow river waters to roam his forest. Island villagers complain the herd tramples their fields and destroys their homes. But Payeng defends the animals and says it is "man that must adjust" to these woods. When islanders suggest that Payeng cut back the forest to dissuade the beasts, he sternly warns, "You will have to kill me first before you kill the trees." Payeng has received one of India's highest civilian awards, the Padma Shri, and many other honors. 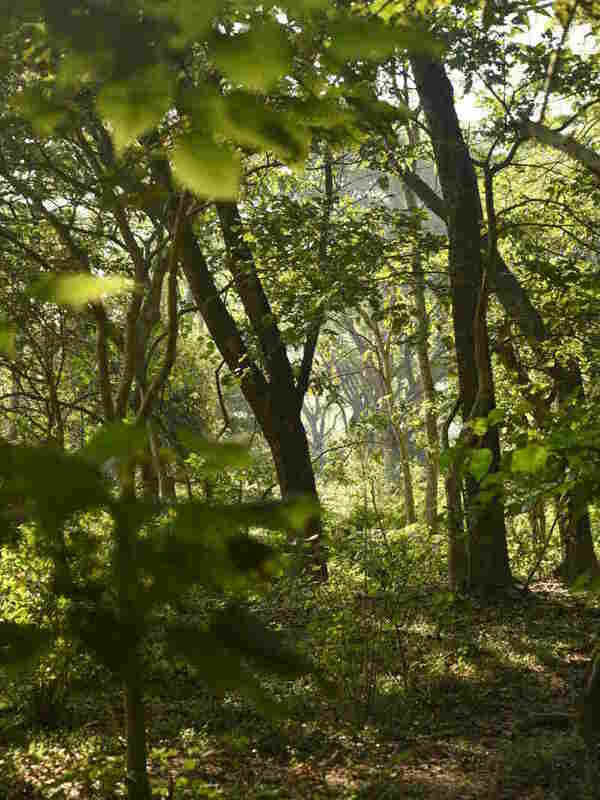 The dense forest bearing his nickname, Molai, now sprawls over 1,300 acres. 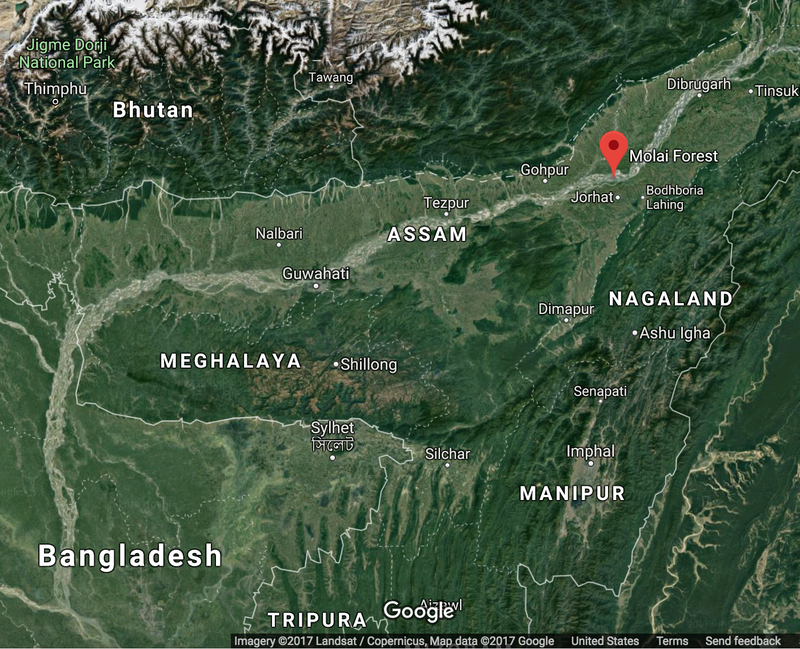 He says he's planting an additional 5,000 acres on the island, aiming to spread the greenery along a 500-mile stretch of the Brahmaputra's barren sandbars and islands. He feels he's "set an example of what one man can do" for the environment. Yet India's Forest Man has lived a life that most people dare not imagine: rising before dawn, paddling across a river, nearly every day, for almost 40 years to replenish nature. When asked how he has sustained his passion, Payeng strikes a metaphysical tone. "No one sees God," he says. "I see God in nature. Nature is God. It gives me inspiration. It gives me power ... As long as it survives, I survive."